Supermarkets are just one of the places where vinyl stickers and adhesive labels are in common use; often we can see them fixed over a barcode, for example, offering the product at a reduced price. Another area where we all will have come across them at some time is in the pharmaceutical industry. Here they would be used widely; this could be to describe the contents of the packet or bottle, very often to tell or describe how the product should be used and stored. With the ever-growing demand for vinyl stickers, we at DataLabel have, through our years of experience, kept abreast with technology. This allows us to produce vinyl labels that are of the very highest quality, and with a print quality that we believe is unmatched. Products which are to be stored and displayed in freezer cabinets require an adhesive that will ensure that the label will not detach. These labels can be produced in the standard matte finish or given a high gloss finish; the latter will also help to protect the label against moisture. Using our state of the art HP Indigo equipment, we provide the highest quality print in full colour and Pantone, varnished or laminated to protect the print. Adhesive can be either peelable, permanent, or hi-tack acrylic and we can usually despatch the labels within just a few working days. 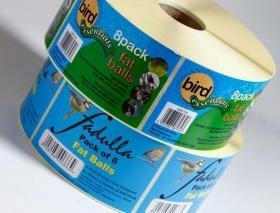 We also offer a wide range of label sizes and shapes to suit your requirements. Get in touch with one of our experienced team, and they can send you a free Vinyl sticker sample pack so that you can see the quality for yourself. You can also request a quotation over the phone on 01293 551520, or you can if you prefer, fill out our quick and simple online enquiry form, and we will call you.